Teachers who use the curriculum share resources here. They range from reviews to projects to Smart Notebook Files for smart board use. It’s mid-September, which means classes have started and both teachers and kids are getting back into the school groove. We’ve been super busy here at eMathInstruction handling orders, sorting through technical issues (lost codes, lost codes, and more lost codes), writing books, and creating add-ons. We’ve got those up and ready for you, so let me lay out what’s new in September. 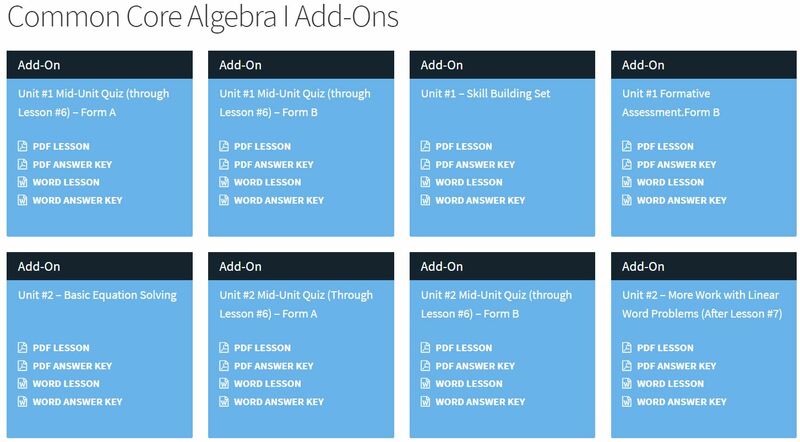 For Common Core Algebra I Add-Ons we’ve got two new Unit 1 resources. First, we have a new Skill Building set. 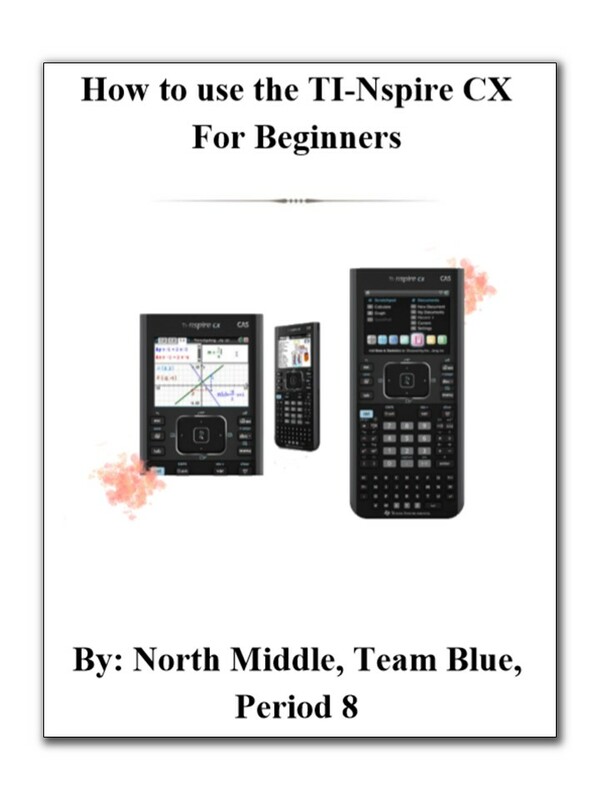 This is our second for Unit 1 and we added it because it is so crucial that students establish these early skills, most of which should be a review from 8th grade and earlier. We’ve also brought you a Unit 1 Assessment Form C. That’s right! This is our third assessment for Unit 1. We’ve heard from teachers that these additional assessments are critical, so we are committed to creating more of them for all of our courses. Common Core Geometry is our “youngest” course and thus has the least add-ons so far. For this month’s Common Core Geometry Add-Ons we bring you two resources for Unit 3 (Euclidean Proof). First we have a Lesson 6 Warm-Up on parallel line terminology and properties. This is a great resource to use to review all of the terminology associated with parallel lines (alternate interior, exterior, same-side, corresponding). Use this if you think your students need this terminology review before higher-level work with parallel lines. We’ve also brought you the Form B (second) Unit 3 Assessment. We will get out a second assessment for each of our Geometry units this year, hopefully having them all done by February. In Common Core Algebra II Add-Ons we bring you a couple of Unit 1 resources. We created a skill building set for Unit 1 similar to the ones we have for Algebra I. This set of problems gives students extra practice on some basic skills that they will need in order to be successful throughout the course. We also bring you the Form C of the Unit 1 Assessment. So, now you have three assessments for this unit to mix and match. Algebra 2 with Trigonometry is our oldest course having been created in 2008, well before the Common Core Standards were adopted in New York (just a little history). For this month’s Algebra 2 with Trigonometry we bring you a Form B exam for Unit 3 (Quadratics). For Unit 4 we have a really nice Quadratic Modeling Extended Problem that has students play around with some projectile physics. I don’t know about anyone else, but I’m pretty happy it’s Friday as I write this. As a teacher, you always sort of forget how good a Friday feels over summer break. But, once schools begins again, there isn’t anything quite like it. For now, enjoy your classes, your kids, and your beautiful fall weekends (Winter is coming). 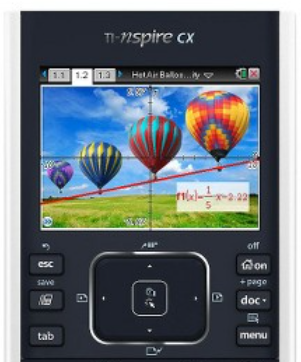 Check these out if you primarily use the TI Inspire calculator and want students to have a great reference for which functions to use on the calculator and when to use them. Thanks again to Jeanne for sharing these files! Well, its cold and dark outside, so it must be December. The waning days of 2017 are upon us. Since it is mid-month, it’s time to release our latest round of add-ons and give you the latest eMathInstruction news. But, first, let’s do the add-ons. For Common Core Algebra I Add-Ons this month we bring you two new lessons, both in Unit #7 on polynomials. We added lessons 7 and 8 which look at both multiplying and factoring polynomials with the help of area models. The second lesson specifically looks at how to factor trinomials by essentially using the AC Method of factoring, but in an area array so that students can more easily see how this factoring relates to the previous lesson where we multiply binomials using area. We do plan to eventually make videos for these two lessons as we feel they are a great addition to the curriculum. As usual, our Common Core Geometry additions this month are in the form of a Unit Review and a Unit Assessment. This month it is Unit #7 – Dilations and Similarity. We’ve put together a huge packet of problems on this unit that should give your students lot of extra practice on these tricky concepts and how they link together. It does look like, at this rate, that we should have the last Unit Review and Assessment for Geometry in the March add-ons. Our Common Core Algebra II Add-Ons this month include one video and one new lesson. We made a video for a lesson we released last year in Unit #6 – Using Structure to Factor Expressions. This is a great lesson where students need to recognize the structure of complex algebraic patterns in order to efficiently factor them. We’ve updated the lesson to add the QR code for easier access to the video. Our new lesson comes from Unit 8 (Radicals and the Quadratic Formula). The lesson is on A Closer Look at Extraneous Roots and should be taught after Lesson 2 on Solving Square Root Equations. This lessons takes an in-depth look at why certain square root equation have extraneous roots introduced and why squaring an expression is an irreversible algebraic manipulation. Finally, for our Algebra 2 and Trigonometry Add-Ons we have two nice new resources. First, we have a Unit #7 (Trigonometric Functions) mid-unit quiz, Form B. Last year we put out a Form A for this quiz and we decided it made sense to create a make-up for this quiz as well. We also created a large set of practice problems on graphing sine and cosine functions. This is a nice resource that gives students lots of extra practice in terms of graphing sine and cosine functions (without a horizontal shift) and also coming up with the equations based on the graphs. And just because we are on the topic of Desmos, here are some other Desmos graphs I created that are particularly fun to play around with. Feel free to open these and play them as eye-candy for your students as they walk into the door. Well, I think that is longer than what anyone wanted to read. It’s time for me to get back to creating curriculum and stocking up the wood stove (did I mention it’s cold in upstate New York today?). Have a wonderful holiday season everyone. Enjoy the long break coming up! These patterns are fun to play with as is Desmos in general. 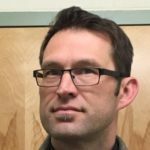 Here are some more Desmos graphs I created and would encourage you to play around with. You can modify these to your heart’s content. I’m hoping to have an update to this post after I get home from the visit. For now, enjoy playing around mathematically! Thanks to Jeff for all of his hard work on this resource and for sharing it with the eMath community of teachers and learners. A new school year has started in the great Northeast. The light is getting dimmer while the trees are getting prettier. We’ve been all sorts of busy this past month at eMathInstruction working on making our site easier to use and coming up with add-ons to the courses. Let’s get right into those. Let’s begin with the Common Core Algebra I Add-Ons. This month we’ve added two new lessons. One fits into Unit #3 between Lesson 6 and 7 (so I’ve given it Lesson 6.5). The lesson title is Motion and Average Rate of Change. We’ve seen quite a few motion problems on the Common Core Algebra I Regents Exam, so I thought it was time we devoted a lesson just to them. We also added Unit 4 – Lesson 9.5 on Solving Absolute Value Equations. We emphasized simple algebraic equations and more complicated graphical ones. Interestingly enough, there is no mention of solving any absolute value equations algebraically in the Common Core Standards, only graphically. Which is why you’ve only seen them that way on the Regents exams. Here’s a good example from June of 2016. Moving right along to Common Core Geometry, recall that our add-ons to the Common Core Geometry curriculum this year will be the Unit Reviews and Unit Assessments. This month we’ve added on every student’s favorite, Unit #3 – Triangle Congruence Proof. We’ve given you a long set of additional problems and a nice assessment. We’ve also published the standards alignment documents in our Table of Contents section. If you’ve been itching to do some standards mapping to our Geometry curriculum, check out that link. For our Common Core Algebra II Add-Ons this month we bring you an additional assessment and lesson. We created a Unit 3 Formative Assessment make up exam. This rounds out the Form B exams for Common Core Algebra II. Now each unit has both an assessment and a mirror make up assessment. We may consider adding additional make up assessments if teachers think it’s a good idea. We also added a lesson to Unit 4. Lesson 7.5 is titled Exponential Modeling Revisited and looks at moving between time units in exponential modeling. For example, if a growth model is given in hours, what would its equivalent look like if modeled in days instead. We’ve seen numerous questions on the New York State CC Alg II Regents exam on these types of questions. Finally there is the old-faithful Algebra 2 with Trigonometry Add-On for this month. After a great deal of resistance on the part of yours truly, I’ve finally created a lesson on factoring trinomials with a method other than guess and check. I created Unit 3 – Lesson 6.6 – Factoring Trinomials Using the AC Method. Teachers who are familiar with this method of factoring already probably have a sense for how this lesson will work. I still believe guessing and checking is important for students, but this method does work and does produce reliable results, at least it does if a student can find the two integers that satisfy the product and sum conditions. A final note on add-ons in general. I’ve been struggling with how to arrange them and have decided to keep placing resources into the add-ons so that they are in Unit order. That means add-ons from last year mix with ones from this year. For teachers who want to only see new add-ons, this isn’t the greatest way of organizing them. Still, for the teacher who just wants to see what resources are there for a particular unit, this is a very effective way to have them arranged. As always, if you have any thoughts either way, feel free to reach out to me. I’ve been waiting on some official word of the timeline before we started to modify our own text. Looks like I have a few years to make that happen. We may, when the time comes (2020), publish a New York edition to our Common Core texts. I’m hopeful by that time we’ve moved to an electronic only textbook. Thanks to Brian Battistoni, my good friend and colleague from Arlington High School, for the heads-up that the Next Gen standards had been officially adopted. Well, I think that’s it for now. I’m hopeful that everyone has had a good start to their school year. 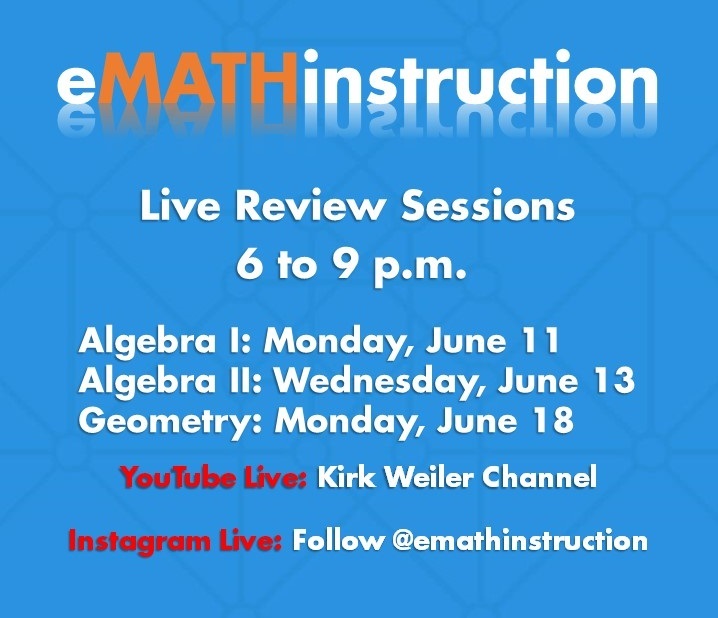 As always, if you are having any troubles with your subscriptions or any suggestions on the curriculum, don’t hesitate to email me at: Kirk@emathinstruction.com. I’m busy, but never too busy to help.